A Stephenian went to pick up his gold medal from Delhi University. He had topped in the MA course. "I have never seen you before," said the head of the university department. "Maybe, that’s why I won the medal," said the Stephenian, who himself heads a department in the college. For all you know, one of his students might be doing the same. 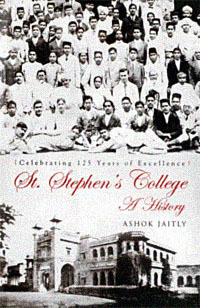 St. Stephen’s College has always had a larger than life image. It evokes emotion, often extreme and has done so for a century and quarter now, ever since the college came into existence on February 1, 1881. The college was named after St. Stephen, the first Christian martyr, to commemorate converts killed in the 1857 tumult. St Stephen’s High School (established 1854) was regarded as its precursor. Three campuses have housed the institution—the original one in Chandni Chowk, the Kashmiri Gate one, from where it shifted to the present building in 1941. The building was designed by Walter George and constructed by R. N. Mathur, an old boy of the college. Though seen by its detractors as a bourgeois establishment, the college has contributed its share of freedom fighters and revolutionaries. Gadar party’s founder General Secretary was Lala Har Dayal (BA-1903); Rashbihari Bose’s associates in an attempt to assassinate the Viceroy, Lord Harding, were Amir Chand and Awadh Bihari, who paid for their conviction with their lives. Much later, the college was a hotbed of the Naxalite movement. However, it has always been known for the many super achievers. The college has a cosmopolitan character, which effectively balanced the pulls of the basically Evangelist management and the needs of education. Being in college itself has been the best part of being educated there for most of the Stephanians. Departments and faculty have varied from first rate to good but they all managed to inculcate in the students something more than other similar institutions. The book covers an impressive span of history. It is anecdotal, which is both its strength and weakness. Stephanians will find much to read about and relate to, like Sukhia was replaced by his son Rohtas at the dhaba, but it is still a veritable institution. Kooler Talk came into existence around the time when I was born, it was still the fun alternative to The Stephanian when I studied there, and is so even now. Eleven principals have led the college, in its 125-year existence. Sushil Kumar Rudra was the first Indian principal. He and his colleague, C. F. Andrews, pushed through a new constitution of the college in 1912, which radically decentralised the structure and introduced more democratic representation of every section of the staff in different administrative bodies. Andrews later became Vice-Principal. He also devoted himself to the freedom movement and became a close associate of Mahatma Gandhi, who often stayed with Principal Rudra in his house. It was here that Rabindra Nath Tagore completed his English translation of Gitanjali. It was also here, earlier, that Sir Chottu Ram had set up the Hookah Club. It ran from 1901-1905, while he was in college. The faculty has included top historians, philosophers, sportsmen and scientists. Students join the college to teach, St Stephen’s College is an institution that has evolved with time and maintained its cosmopolitan and democratic character, having in itself the strength to correct its course when necessary. Any book of this kind is a selective one—inevitably what the writer chooses to write about is shaped by his experiences in the college. Jaitly has managed to do a good job in juggling the demands of many. Of special interest are the photographs, which enhance the book, which is bound to be read widely, but then, anything about St Stephen’s College makes waves, whether it is Stephanians’ antics in front of Miranda House, or their feats. The year was 1977. Standing near the college dhaba, one heard the following exchange between visiting students: "They have this canteen, which they call Caf`E9 and I don’t know, today we will have tea here, even if it costs Rs 10." Tea those days cost only 60 paise—you had to go to Hotel Taj on Man Singh Road to spend Rs 10 on it. The college—even its canteen, has always enjoyed a larger-than-life aura.